#278. I Got Rid of Most of My Clothes & Feel Awesome About It — Hey Eleanor! Ever opened your closet and declared, I have nothing to wear! 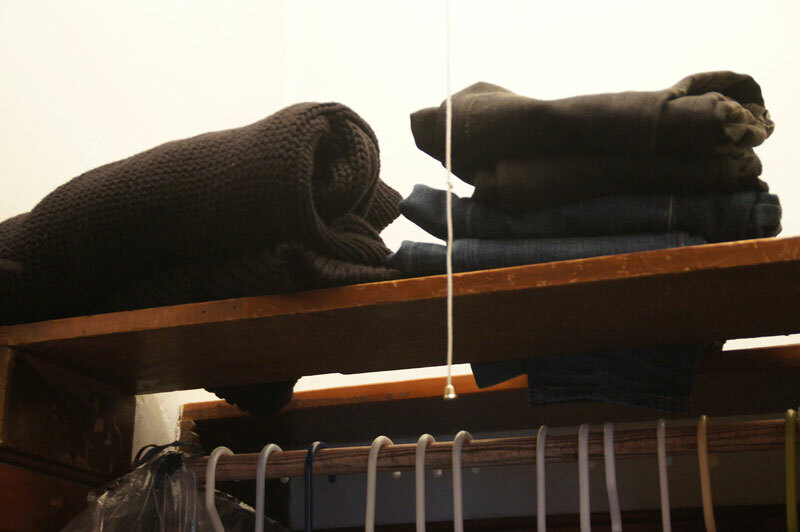 Even though your closet is so crammed, you couldn't squeeze a sneeze in there. Of course you've been there. You are a person. I've been reading a lot about capsule wardrobes. The gist: You only have about 35 items that you absolutely love in your closet at a time. That's all you wear for a full season (aka 3 months). Sound cool? I was intrigued. Then I started reading the Un-fancy blog and was sold. You can read more about it here. To me, capsule wardrobes sound both exciting and terrifying. I always gravitate toward the same pieces. Sometimes I'll wear something not because I love it, but from the guilt of owning it and letting it rot in my closet. Less options means less hemming & hawing when you're getting dressed. It's like a restaurant with too many items on the menu... so overwhelming! I'm constantly promising myself I'm not gonna buy any more striped t-shirts, then can't pass on the nearly-free striped tees at the Gap (ugh, so many sales!). Cheap stuff adds up to a lot of cashola, especially if you don't really love or wear it. I love the idea of only wearing clothes I adore. And think about how much time I'd save if I quit shopping as a sport! Since I am now working from home, I also love the idea of making shopping NOT AN OPTION. Will I be judged for wearing the same stuff all the time? Will I get bored? Will my clothes be boring?! What if I pick the wrong stuff and hate my wardrobe for 3 months? What about all the time and money I've invested in my current wardrobe (even if I never wear 50 percent of it)? And will I end up doing laundry in just a towel because everything I own is dirty? Though apprehensive, I decided to try it. Here's why: Paring down your closet forces you to identify what you love. It teaches restraint and thriftiness. Theoretically, it lessens your stress and ups your confidence. What I love the most is how this makes you set standards. It forces you to look at every pair of jeans or shirt and think, "if I could only have one, would this be it?" If we applied that thought process to our romantic relationships, jobs, friendships, travel, everything, do you think we'd all be happier? I think so. So I purged most of my TINY closet (oh, old houses, you're so quaint!). I am a little ashamed of these before photos, but here they are. BEFORE: My jam packed closet, pre-purge. BEFORE: Emptying the dresser. Brutal. Once I'd sorted everything, I was shocked. Only 15-ish things in the LOVE pile. What have I been buying?! The LOVE stuff went back into the closet. LIKE stuff went into a big plastic tub in the basement (I have two: fall/winter & spring/summer). The OVER IT, BUT NICE stuff went to Buffalo Exchange where I sold it and made $140! The HSWWIT pile went to Goodwill. AFTER: All of the shoes! A year ago, I sequestered all of my shoes into our guest bedroom because I ran out of space. Here, I've selected 8 lucky pairs and moved them back into my closet. Hi, old friends! AFTER: Breathing room for my duds. AFTER: 5 measly items sitting on a shelf. Stuff I love, just hanging in my closet. AFTER: Two jackets, a scarf and a sweater. That's it. There was, however, one item in my LOVE pile that didn't return to the closet. If you've seen me any time between September and late April, I was probably wearing my favorite sweater. I've lived in this cardigan for at least four years. It's like my own sartorial Velveteen Rabbit (though I hope it never comes alive because that would be creepy). She's a Monet: Great from a distance, but up close it's a mess. These days, the cardigan is ragged and pilly, with a spots from spilled coffee and probably wine. She's no longer fit for public outings, so I'm putting her to pasture in the most respectable way. Per Sarah Von Bargen's suggestion, I made her my house sweater. Thank you for being there, sweater. I dedicate this song to you. As of right now, I'm on a personal shopping freeze through December 31. So far, I am actually loving it. Prior to the freeze, I did purchase a few new items to round out my winter wardrobe, but in general, I feel so light an unencumbered. It's a good feeling. I'll be posting pics of my wardrobe & outfits starting next week. EEEK! PS This isn't the first time I've tackled fashion. Remember when I wore that god awful hot pink jumpsuit (sold it to Buffalo Exchange, btw! ), or waited in an hour-plus line for over-priced yoga clothes, OR my favorite... PRESS-ON nails!